Who wouldn't want to stock the freezer for this guy? 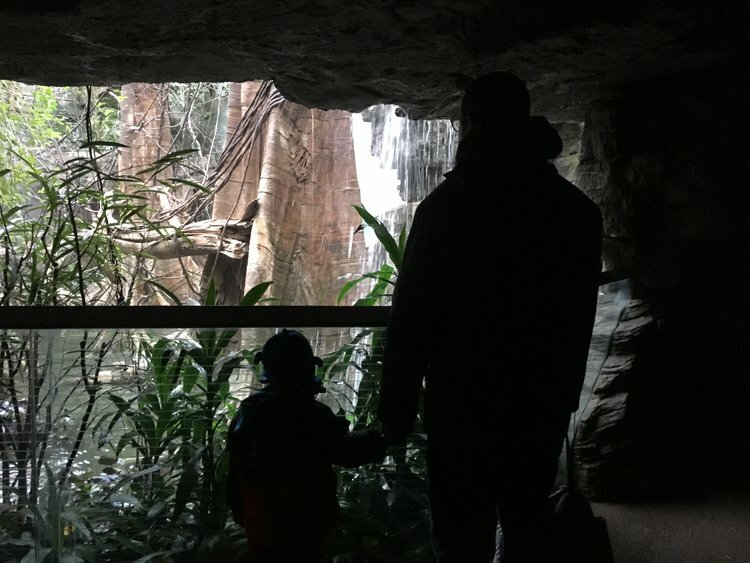 (Shown here introducing his son to his favorite part of the Bronx Zoo. I went to yoga for the first time in over a year this week. Before the class and before I began to sweat from my knuckles (hot yoga! ), the instructor said: "You are not thinking of what is to come. You are HERE. NOW." And it made me think about how hard that actually is, to not think about what is coming and just to be right where I am. I knew I would get here, to the time where I was also on the list of people my Mom didn't recognize. I figured it would happen dramatically, in person and all at once. I saw myself needing to remind Mom of who I was and everyone being embarrassed and sad. It happened like this for my husband. We were meeting Mom for dinner and she saw him first. Instead of the split second pause and then smile of recognition there was nothing, just a blank stare at him with nothing behind the stare. It wasn't until she saw me that something clicked and then she smiled at him as well, making the connection. But he saw it and knew she didn't know him. Which broke my heart for him. Because he loves her too, and because she used to not only recognize him but remember his favorite desserts and that he loves raspberry sorbet with chocolate chips. She would stock the freezer with his favorite things before we came to visit. All for the coffee mug. When my Mom didn't know me, it happened over the phone and on an unexpected Tuesday. I called Mom to tell her I was going to stop by to say hello. I've stopped setting up times and dates, finally realizing that when Mom said she was "writing it down" all she was doing was writing a number, any number, over and over again. Not so helpful really. So now I just call when I am already on the way over to her apartment (a 20 minute walk away from my house). So I called and said "Hey Mom, it's me, Patti". Years ago, I used to just say "Hi Mom!". I've started adding "It's Patti" maybe a year ago. Sometimes I even say "It's Patti your daughter". Sometimes there is a second pause and then there is always some recognition, the subtle softening of the voice when you realize you are talking to someone you love and know, instead of NPR asking you to join their membership drive. Speaking of which, I hate "Science Friday". There. That is out there now. I love that he is looking at her like that and that they are holding hands. But this time the pause was there after I said who is was on the phone, and then there was no recognition. She quickly launched into the same story that she has told a hundred times. She said some general things about liking where she is living and that her husband died and that people are old where she lives (truth) but she likes it and did I know that they have movies every night? I've heard all of these things before. She tells these stories when she has no idea who she is talking to. She tells them to her brothers, to friends from Connecticut that she can no longer place and to random callers or people she sees in the elevator. But usually I am spared them and she will ask me how my kids are doing and if I am eating "something green" to stay healthy. For the first time I was just another voice, another stranger on the line. Not the person she gave birth to and certainly not someone special, or different. So today is probably less funny than other posts (but come back for the world's grossest mouse story- Coming Soon! ), because I am so frustrated that this disease is taking my Mom. I see her needing more care and at the same time my relationship with her is deteriorating. I long for the time when I would call, and my Mom would hear "something in my voice" and use her Mom spidey sense to get it out of me. I once called to tell her I had just had a miscarriage and I remember her saying "I thought you had been pregnant. I could hear it in your voice- that excitement". That's how good she was. I just realized that the other kid that is dressed is wearing pajamas. We have always been on trend. I saw Mom after this phone call and she knew who I was. She gave me that smile of recognition and proudly told the "old people" in the elevator that I was her daughter and that these were my children. She didn't know her grandchildren's names, but she knew we were family. I know that we will have another phone call soon and it's possible she won't know me again, or maybe she will. I'm really trying just to be HERE. NOW. And because I would be a hypocrite if I wasn't trying for some joy I want to share this wonderful picture with you. 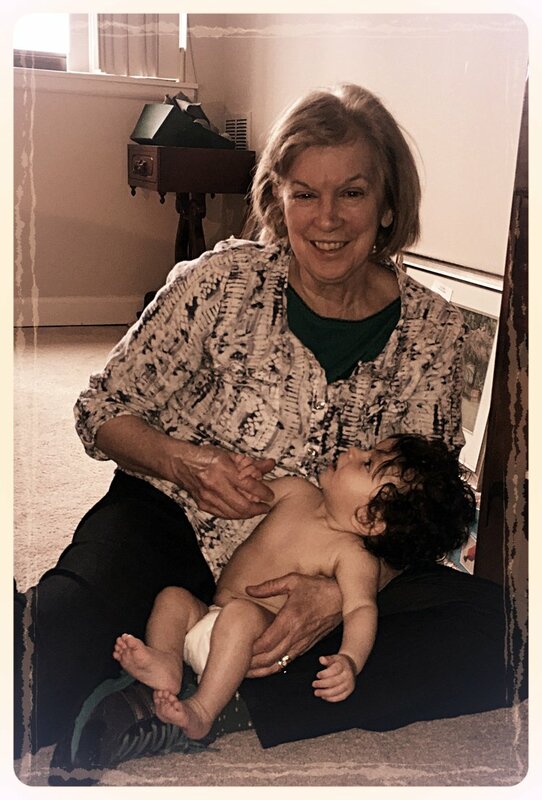 This is one of the only times that Mom has held my little man (Because I am very sure that she would drop him). When things get bad I wonder what it will be like for these boys to know their Grandmother is sick. 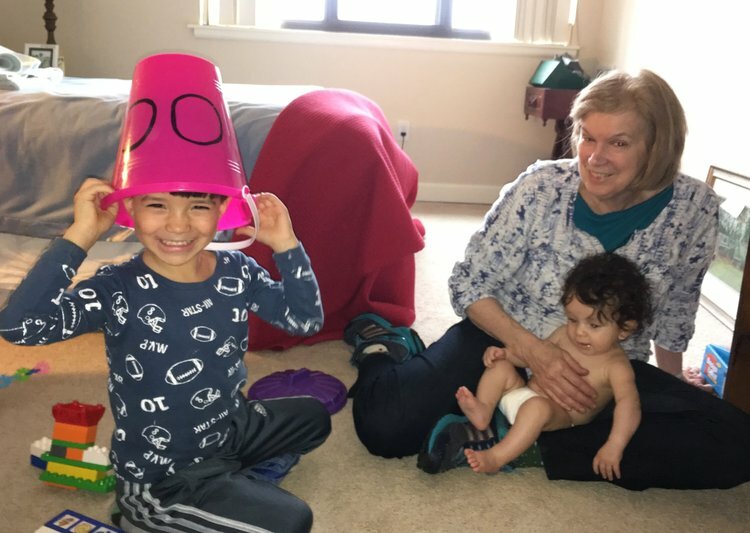 But for right now, they only know that Grandma thinks it's funny if a bucket is on their head.